For the best cost-effective & Reliable GPS tracked leaflet distribution in Surrey, Shareplan Leaflet Distribution can offer you a complete design, print and distribution service. Surrey is an affluent county with a service based economy closely tied to that of London. The county is said to have the highest proportion of millionaires in the UK. Today’s Surrey is divided into 11 districts: Elm bridge, Epsom and Ewell, Guildford, Mole Valley, Reigate and Banstead, Runnymede, Spelthorne, Surrey Heath, Tunbridge, Waverley and Woking. 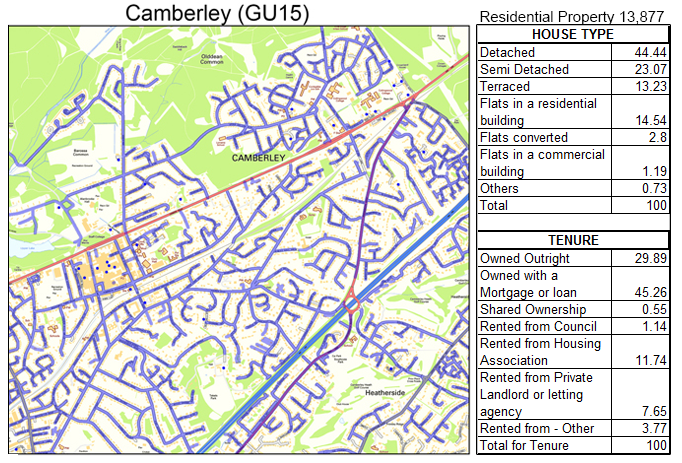 For example, in Woking there are a total of 13,877 residential properties in the postcode GU15. If you want to target a specific service for the owners of the detached and semi-detached houses we can tell you that about 75.15% of the properties are occupied by the owners. At Shareplan Leaflet Distribution we believe your leaflet design is a key for ensuring your Surrey marketing & promotional delivery campaign is as successful and effective as possible. Our free one-to-one consultation gives you the chance to chat to one of our in-house marketing experts. After all, we want your campaign to be as successful as possible because the more successful you are, the more successful we are! If you have no idea at all where you want to start with your Surrey Leaflet Delivery campaign, you can even use our graphic design service. Our in-house design team will help you get the most from your direct response marketing. Of course, the Surrey door-to-door distribution service wouldn’t be complete without the chance to make unbelievable savings on your printing! Surrey Leaflet Printing and Distribution packages ensure you get a discount on your Surrey door-to-door flyer distribution when you order both your print and flyer delivery together from us! With our Surrey door-to-door delivery service attracting a repeat business rate of over 80%, you can’t go wrong with our complete service. Click the link to get your free quote now! Our Surrey flyer distribution is available in all the main towns including: Ashtead, Banstead, Camberley, Carshalton, Caterham, Cheam, Chertsey, Cobham, Coulsdon, Cranleigh, Croydon, Dorking, East Molesey, Egham, Epsom, Esher, Farnham, Frimley, Godalming, Godstone, Guildford, Haslemere, Hindhead, Horley, Kingston upon Thames, Leatherhead, Lightwater, Lingfield, Mitcham, Morden, Myichett, New Malden, Oxted, Purley, Redhill, Reigate, Richmond, South Croydon, Surbiton, Sutton, Thornton Heath, Wallington, Walton-on-Thames, West Byfleet, Weybridge, Windlesham and Woking. Please feel free to take a look at our other coverage areas and also visit our FAQ if you have any other unanswered questions.